PSL’s FilterBox is the optimum contained filtration and drying solution for handling highly potent APIs and other highly active or cytotoxic compounds. The FilterBox is pioneering powder handling technology that provides fully contained filtration, drying, charging, sampling, discharging, base-opening and cleaning, as well as filter mesh inspection and changing. PSL’s GFD FilterBox is an acrylic glovebox surrounding PSL’s MINI LAB (0.002m²) or LAB (0.01m²) Glass Filter Dryer (GFD ). It is an ideal solution for small scale synthesis of highly active products. PSL’s Production FilterBox is a stainless steel glove box isolator surrounding PSL’s MAXI LAB (0.05m²) Glass Filter Dryer (GFD ) or a 0.125m², 0.2m² or 0.3m² agitated nutsche filter dryer. 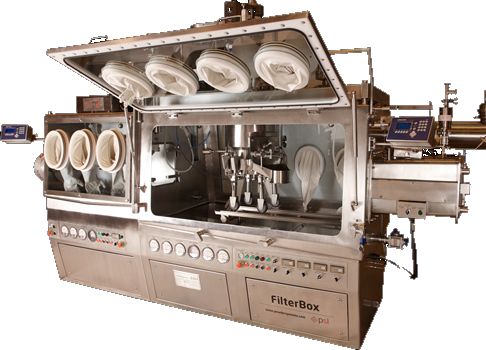 FilterBox provides the optimum contained filtration and drying solution for handling highly potent APIs and guarantees high containment to nanogram levels.